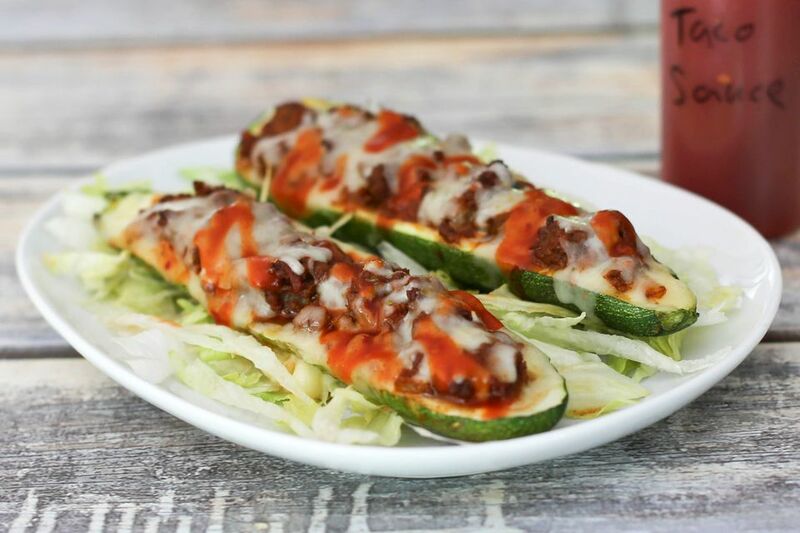 Beefy taco filling takes these zucchini boats to a new level. The filling for these stuffed zucchini halves is a seasoned ground beef taco mixture. Top the zucchini off with shredded pepper jack cheese or a Mexican blend of cheeses, along with a drizzling of taco sauce and serve them with your favorite garnishes. Serve the zucchini with cauliflower "rice" if you're low-carbing it, or add easy Mexican-style rice or plain boiled rice. Refried beans make a delicious side dish as well. Line a large rimmed baking pan with foil. Wash the zucchini and cut each one in half lengthwise. With a spoon, scrape out the seed portion of the zucchini, taking care to leave at least 1/4 inch of outer shell. Arrange the zucchini halves in the prepared baking pan, cut and hollowed side up. Set aside while you make the taco beef mixture. Heat the olive oil in a large skillet or saute pan over medium heat. Add the onions and cook, stirring, for about 3 minutes. Add the ground beef and continue cooking, stirring and breaking up until the beef is no longer pink and the onion is translucent. Drain off excess fat. Add the garlic to the ground beef and cook for about 2 minutes longer. Stir in the taco seasoning, salsa, and water; blend well and cook, stirring, until hot and bubbly. Spoon about 1/2 cup of the ground beef mixture into each zucchini shell, mounding it a bit. Bake for about 35 to 45 minutes, until the zucchini is fork-tender. Top the zucchini with the shredded cheese and continue baking for a few minutes longer, or just until the cheese has melted. Serve with taco sauce and garnish with lettuce and sour cream or guacamole, or use your favorite toppings. Sliced ripe olives, diced tomatoes, jalapeno rings, or more cheese are all excellent choices. *If you use the lower salt homemade taco seasoning, taste the ground beef mixture and add salt, as needed.